Vacuum is provided by a 1/2 HP double-headed rocking piston type diaphragm pump. 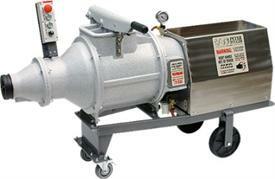 These new technology pumps are the simplest and quietest vacuum source available. They are maintenance-free and long lasting. The VPM-60 Power Wedger does not require a large vacuum pump because the clay is continuously exposed to vacuum in the sealed mixing chamber.Once the clay chamber is evacuated, the vacuum pump can be turned off.